Help support childhood cancer by holding a bake sale fundraiser. Team Daniella’s first fundraiser was a bake sale held in our own front yard. Because of the support of our community showed us that day we were able to travel to Comers Children’s Hospital in Chicago, IL to get a second opinion on Daniella’s treatment plan. Now you can continue supporting children with cancer and funding research by holding a bake sale fundraiser to support Team Daniella’s Foundation. All you have to do is register by emailing foundation@teamdaniella.org we will provide a fundraising kit as well as answer any questions and guide you along the way. 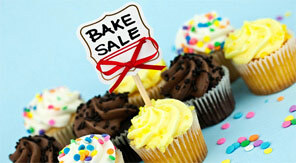 We can also be contacted by calling 786.339.7560 for more information on creating your own fundraiser bake sale. A simple way to help support Team Daniella’s Foundation is by simply using our link to Amazon Smile, shopping through Amazon Smile a portion of your purchase will benefit Team Daniella Foundation and will help us continue our mission. Team Daniella’s Foundation Coin Box allows you to help children battling cancer. Every penny counts! There are so many children and families dealing with this battle of childhood cancer. They need your help! No one fights alone! 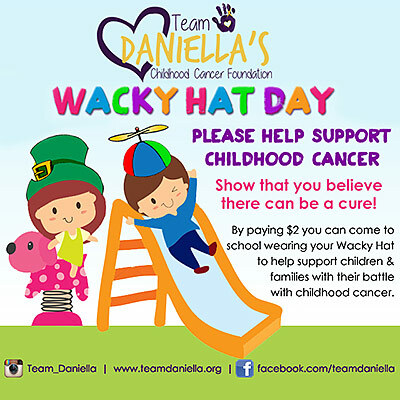 Wacky Hat Day is a school fundraiser for public and private schools that donates $2 per person and allows children to come to school with a Wacky Hat to help support children & families with their battle with childhood cancer. 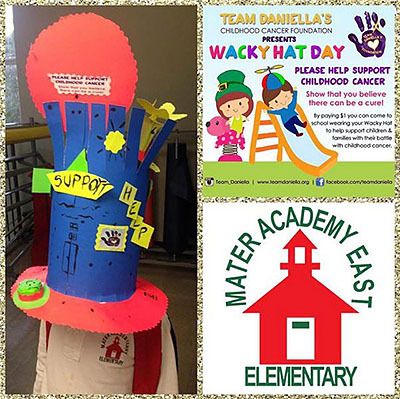 Thank you at Mater Academy East Charter School students and teachers for taking part of “Wacky Hat Day” fundraiser. Look how creative this student was making his own wacky hat to support children battling cancer!! Pretty amazing to see children helping children! !